Rule out any serious pathological condition that may require referral to a medical practitioner for further investigation or surgical intervention. Identify movement dysfunction, impaired motor control, sensorimotor impairment, and related connective and nerve tissue dysfunction and if possible rule in or out particular conditions. Identify other contributing factors that might affect deviations form expected clinical course of neck pain. Taking a detailed patient history is important. Listen carefully to the patient’s past medical history (PMH) and history of present illness (HPI). The narrative given by the patient contains much of the information needed to rule out red flags and guide the cervical examination. When taking the patients history it is also important to ask if they have pain or symptoms in other regions such as their thoracic spine or shoulder. Patients with neck pain should be questioned for the presence of red flags. A thorough medical history and possibly the use of a medical screening form is the initial step in the screening process. The chart below highlights some of the most common red flag conditions for patients with neck pain. If there has been trauma, follow the Canadian C-Spine Rule. Yellow flags are factors that increase a patient’s risk for developing long-term disability. Psychosocial factors may be contributing to a patient’s persistent pain and disability, or that may contribute to the transition of an acute condition to a chronic, disabling condition. Some attitudes and beliefs to look out for are. The Fear-Avoidance Beliefs Questionnaire (FABQ) is a tool to assess yellow flags among patients. The FABQ predictive validity is debatable, and is best for the FABQ-W when evaluating workers compensation patients. The overall test-retest reliability is excellent, ICC= .97. The Pain Catastrophizing Scale, helps determine if the patient is exaggerating their pain and symptoms and the severity of the situations as a whole. Cronbach alpha values reported for the total Pain Catastrophizing Scale (PCS) (α=.87) and factor scales (Rumination α=.87; Magnification α=.60; Helplessness α=.87) were found to be satisfactory. The total PCS score showed strong temporal validity. In a patient population with acute whiplash there was found to be a significant moderate correlation between pain pressure threshold and the pain catastrophizing scale as well as cold pain threshold and the pain catastrophizing scale. Diagnostic Imaging Considerations: see Canadian C-spine Rules. If patient is positive on the rule a referral for imaging is required. Cervical spine radiograph are most commonly utilized to assess for fractures; however cervical CT is more sensitive for ruling out fractures. Patients with rapidly worsening neurological signs and symptoms should be referred for a cervical MRI. Patients with red flags including a history of cancer, possible cervical arterial disease, and possible instability should be referred for diagnostic imaging procedures. Minimal detectable change is 5 (10%). This self report is a practical alternative supplement to generic and condition-specific measures. Movement or activity limitations associated with the patient’s neck pain and be used to assess the changes in the patient’s level of function over the episode of care. These activities should be measurable and reproducible. This is commonly referred to as an asterisk sign. Have the patient perform an activity that produces their symptoms such as looking over their shoulder as if they were checking a blind spot when driving, and note at which point in the motion symptoms are elicited. After intervention this can be reassessed to see if symptoms are decreased, or range of motion is gained which would indicate an improvement in function. neck pain with radiating pain/cervical radiculopathy, including the upper limb tension test, Spurling's test, distraction test, and the Valsalva test. Cranial cervical flexion and neck flexor muscle endurance tests may be use in assessing movement coordination impairments, and algometric assessment of pressure pain threshold may be useful in staging chronicity of neck pain. Before anything else ask the patient to demonstrate the functional movement that most easily replicates their symptoms. The movement that the patient demonstrates can give many clues to the main cause of the problem as well as a good performance based outcome measure. Prior to movement testing the examiner asks the patient about baseline symptom location and intensity. The examiner notes any change in location or intensity during the testing and where in the motion they occur. The examiner should assess for the presence of symptom centralisation and peripheralisation during testing. Repeated motions may be utilised as part of this assessment. Cervical ROM tests can be measured with an inclinometer. Inclinometer cervical ROM measurements have exhibited reliability coefficients ranging from 0.66 to 0.84 (ICC). A universal goniometer is used to measure cervical rotation if measured in sitting. Passive overpressure may be applied at the end of active motion to assess for pain response and end-feel. Upper cervical flexion and lower cervical extension is assessed with cervical retraction. Upper cervical extension with lower cervical extension is assessed with cervical protraction. The cervical quadrant involves combined cervical extension with ipsilateral rotation and sidebending. The patient is positioned in prone. Cervical and thoracic spine segmental mobility and pain response are assessed. The examiner contacts each cervical spinous process with the thumbs. The examiner applies an oscillatory posterior to anterior force. The examiner can assess mobility unilaterally by performing the same procedure over the cervical articular pillar on each side. The examiner assesses for pain provocation at each segment. The mobility of the segments is judged to be normal, hypermobile, or hypomobile. Interpretation of mobility is based on the clinician’s perception and experience. Presence of upper cervical Joint dysfunction in patients with headaches ICC = 0.78 – 1.0. Translate the occiput posteriorly to assess for OA flexion restriction. Testing in supine or seated position. Palpate bilateral sternoclavicular joints for mobility assessment or tenderness. Palpate acromioclavicular joint for mobility assessment or tenderness. Palpate suboccipital muscles, upper trapezius, levator scapula and pectoralis minor to assess shortness or tenderness. A neurological examination should be performed if the patient reports numbness or tingling in the back, shoulder, or more distal upper extremities, or if the patient has focal weakness that would indicate nerve involvement. Pupillary reaction, (constriction) is tested by shining a light in the left eye and right eye. If there is an absence of constriction this indicates abnormal function of the optic or oculomotor nerve. Extraocular movements are tested by asking the patient to follow a moving finger in a horizontal, vertical and horizontal plane. If they eyeball deviates from it’s normal conjugate position, eye movements are impaired or the patient reports double vision, there is dysfunction of the oculomotor, trochlear and/or abducens nerve(s). Motor: Test the muscles of mastication by asking the patient to clench their teeth. Weakness, wasting of muscles or unilateral jaw deviation indicate a trigeminal nerve lesion. Facial expression is tested by asking the patient to raise eyebrows, frown, show teeth, smile, close eyes tightly and puff out both cheeks. Paralysis is indicated by the patient’s inability to close eye, drooping corner of the mouth or difficulty with speech articulation. Dysphonia: Hoarseness denotes vocal cord weakness; nasal voice quality indicates palatal weakness. Have the patient shrug both shoulders upward against resistance. An inability to shrug bilateral shoulders upward against resistance may indicate a lesion to the spinal accessory nerve. The patient is positioned in supine in hook lying with the head and neck in mid-range neutral. Towels may be needed under the occiput to achieve this neutral position. A pneumatic pressure device, such as a pressure biofeedback unit, is inflated to 20 mmHg to fill the space between the cervical lordotic curve and the surface of the table. While keeping the occiput stationary (not lifting or pushing down), the patient performs the CCF in a graded fashion in 5 increments (22,24,26,28 and 30mmHg) and aims to hold each position for 10 seconds. 10 seconds rest is provided between stages. CCF is performed by the patient gently nodding the head as though they were saying “yes” with the upper neck. This motion should flatten the cervical lordosis and subsequently change the pressure in the pneumatic device. While the patient is performing CCF, the therapist palpates the neck to monitor for unwanted activation of more superficial cervical muscles such as sternocleidomastoid. The test is graded according to the pressure level the patient can achieve with concentric contractions and accurately sustain isometrically. The test is terminated when the pressure is decreased by more than 20% or when the patient cannot perform the proper CCF movement without substitution strategies. A normal response is for the pressure to increase between 26 – 30 mmHg and be maintained for 10 seconds without utilizing superficial cervical muscle substitution strategies. Uses a sudden movement of the chin or pushing (extending) the neck forcefully against the pneumatic pressure device. The patient is positioned in supine, in hook lying. The chin is maximally retracted and maintained isometrically while the patient lifts the head and neck until the head is approximately 2.5cm (1 in) above the plinth while keep the head retracted to the chest. The therapist focuses on the skin folds along the patient’s neck and places a hand on the table just below the occipital bone of the patient’s head. The therapist gives verbal commands such as “tuck your chin” or “hold your head up” whenever the skin folds begin to separate or the patient’s occiput touches the therapist’s hand. The test is terminated if the skin fold(s) is/are separated due to loss of chin tuck or the patient’s head touches the clinician’s hand for more than 1 second. The patient is positioned in supine. 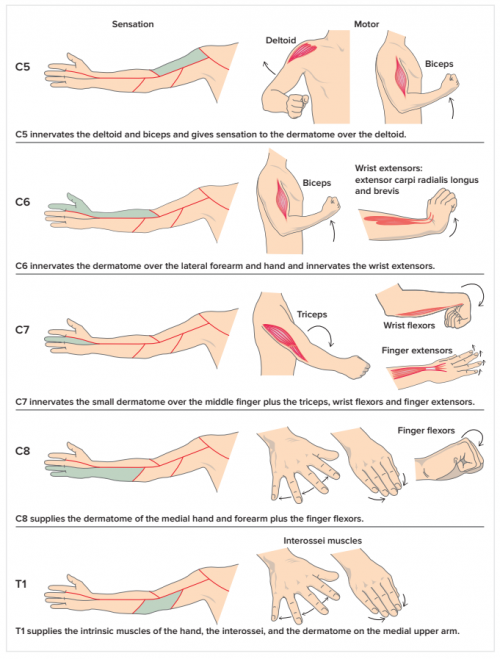 During the ULTT that places a bias towards testing the patient’s response to tension placed on the median nerve, the examiner sequentially introduces the following movements to the symptomatic upper extremity. The patient is seated and asked to sidebend and slightly rotate head to the painful side. The clinician places a compressive force of approximately 7 kg through the top of the head in an effort to further narrow the intervertebral foramen. The test is considered positive when it reproduces the patient’s symptoms. The test is not indicated if the patient does not have upper extremity or scapular region symptoms. The patient is positioned in supine. The examiner grasps under the chin and occiput, flexes the patient’s neck to a position of comfort, and gradually applies a distraction force of up to approximately 14 kg. A positive test occurs with the reduction or elimination of the patient’s upper extremity or scapular symptoms. The test is not indicated if the patient has no upper extremity or scapular region symptoms. The patient is seated and instructed to take a deep breath and hold it while attempting to exhale for 2 – 3 seconds. #A positive response occurs with reproduction of symptoms. From where is the pain arising? The therapist seeks to understand characteristics about the pain source and thus select appropriate tests and measures early in the physical examination to rule out conditions. The therapist considers what other variables are present that serve to maintain or perpetuate the pain experience such as depression, passive coping, central pain hypersensitivity, and fear. ↑ 1.0 1.1 1.2 Blanpied PR, Gross AR, Elliott JM, Devaney LL, Clewley D, Walton DM, Sparks C, Robertson EK, Altman RD, Beattie P, Boeglin E. Neck Pain: Revision 2017: Clinical Practice Guidelines Linked to the International Classification of Functioning, Disability and Health From the Orthopaedic Section of the American Physical Therapy Association. Journal of Orthopaedic & Sports Physical Therapy. 2017 Jul;47(7):A1-83. ↑ 2.0 2.1 2.2 2.3 Flynn TW, Cleland JA, Whitman JM. User’s Guide to the Musculoskeletal Examination: Fundamentals for the Evidence Based Clinician. Evidence in Motion. 2008. ↑ 6.00 6.01 6.02 6.03 6.04 6.05 6.06 6.07 6.08 6.09 6.10 6.11 6.12 6.13 6.14 Childs JD et al. Neck Pain: Clinical Practice Guidelines Linked to the International Classification of Functioning, Disability, and Health From the Orthopaedic Section of the American Physical Therapy Association. The Journal of Orthopaedic Sports Physical Therapy. 2008;38(9):A1-A34. ↑ O’Sullivan SB, Schmitz TJ. Physical Rehabilitation: Fifth Edition. Philadelphia: F.A. Davis Company; 2007. ↑ Murphy DR, Hurwitz EL. A theoretical model for the development of a diagnosis-based clinical decision rule for the management of patients with spinal pain. BMC Musculoskelet Disord. 2007, Aug 3;8:75.